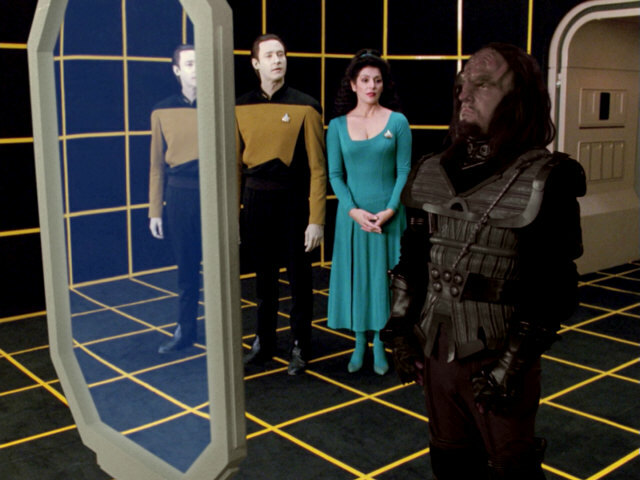 Ex Astris Scientia - Observations in TNG: "The Offspring"
Here are some observations about sets, props and visual effects in TNG: "The Offspring" without a specific theme, and a comparison of the original TV release (TNG) with the remastered episode (TNG-R). 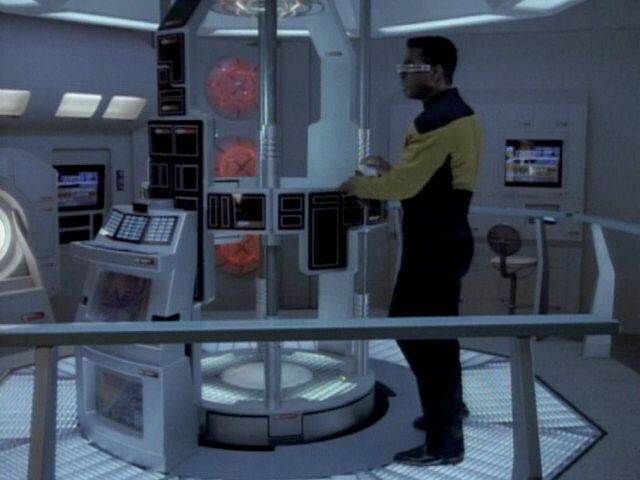 The cybernetics lab set was last seen as the bridge of the USS Enterprise-C in "Yesterday's Enterprise". 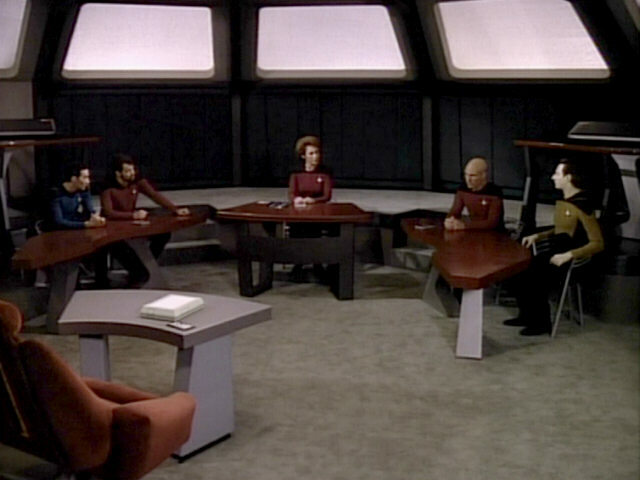 It appears as a very basic set in this episode, similar to when the set was used as the Starbase 173 courtroom in "The Measure of a Man". 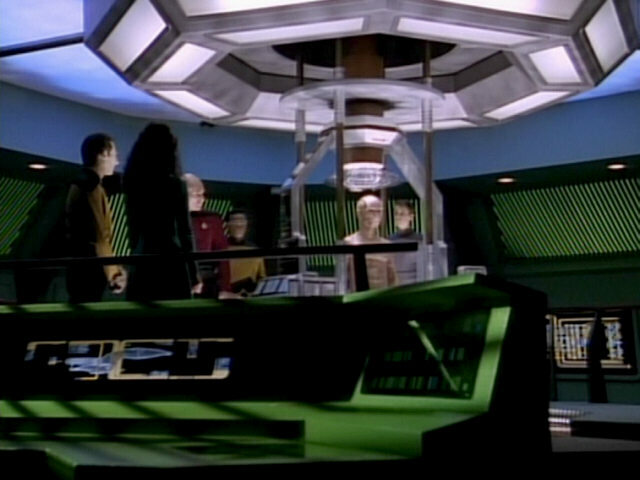 The octagonal ceiling structure at the center of the lab first appears in this episode. 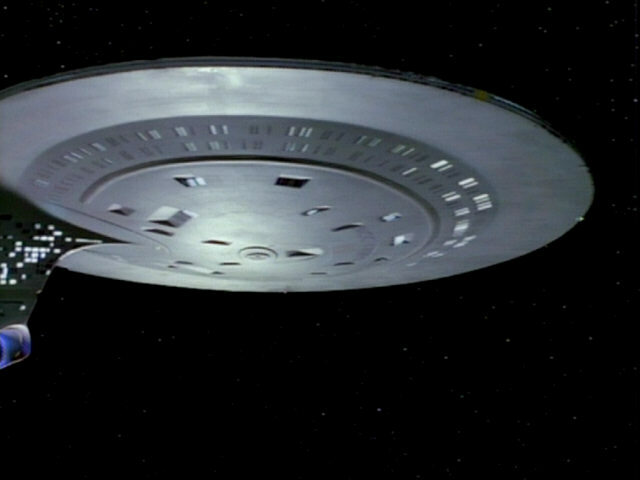 It was seen as part of the ceiling of many rooms seen in later episodes, including the ceiling of the USS Sutherland and USS Brattain bridges and the ceiling of the medical room on Malcor III. 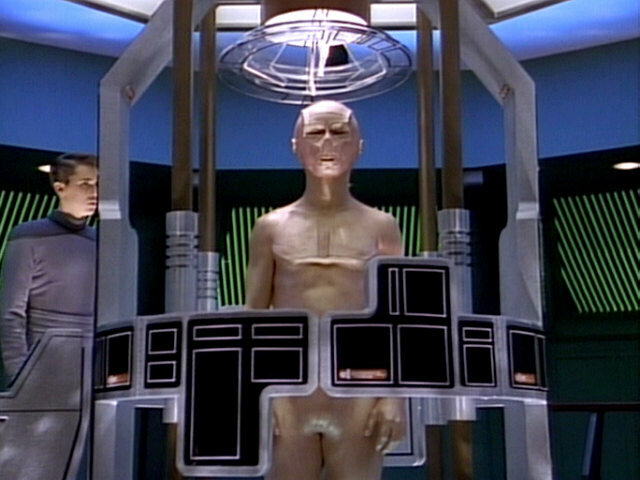 The cybernetics lab (featuring the octagonal ceiling structure) reappeared in some later episodes, namely "The Best of Both Worlds II", "I, Borg", "Time's Arrow II" and "Interface". 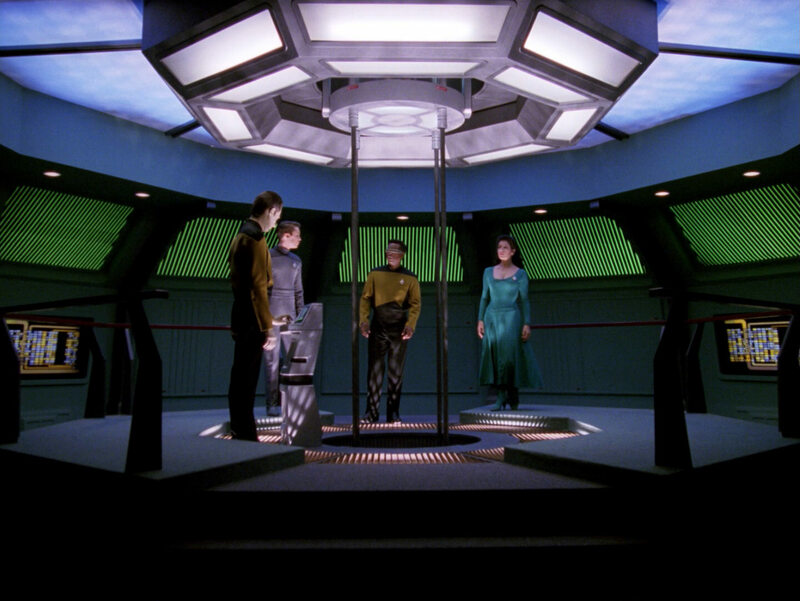 A different set was used in those episodes, though. 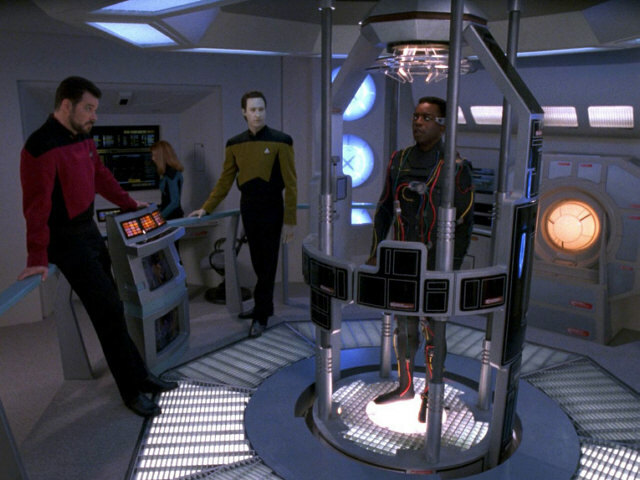 This is the only episode in which the set (which originally was the bridge of the USS Enterprise in the first four Star Trek films) was converted into the cybernetics lab. 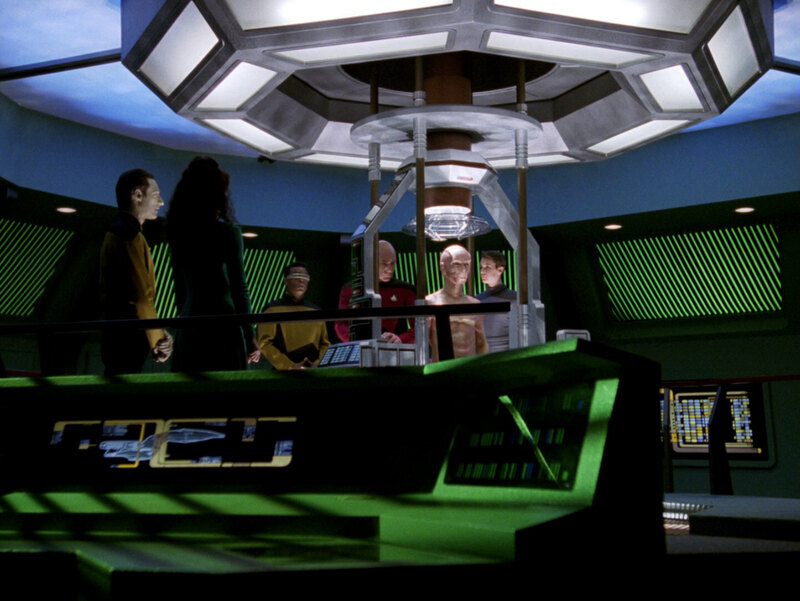 Enterprise" A better look at the lab in HD. 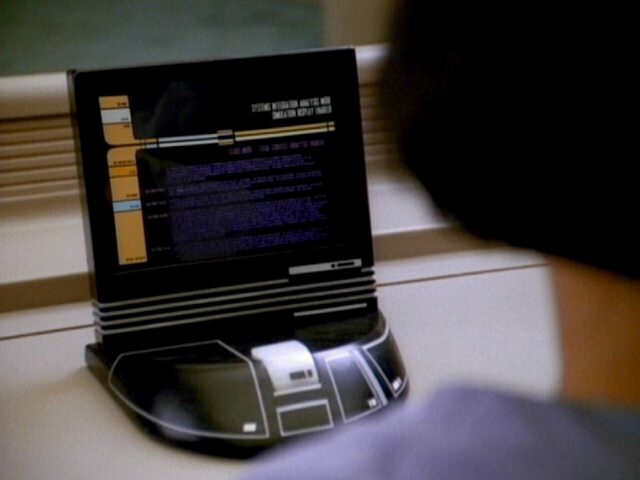 The console featuring an LCARS display of the USS Enterprise-D originally appeared in drawing room 5 in "Booby Trap". 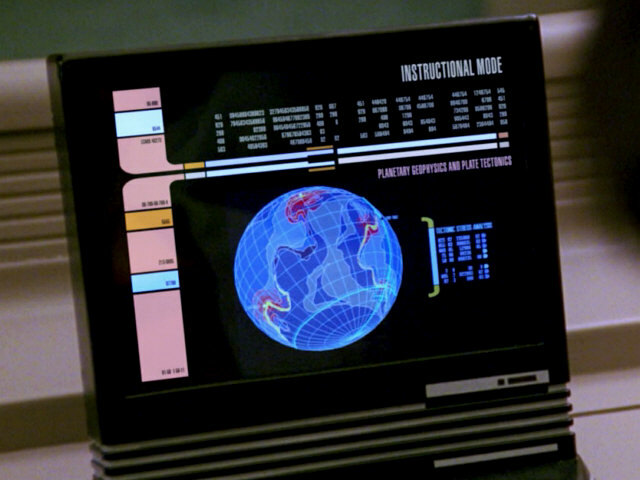 The LCARS display hasn't changed since the first appearance of the console. 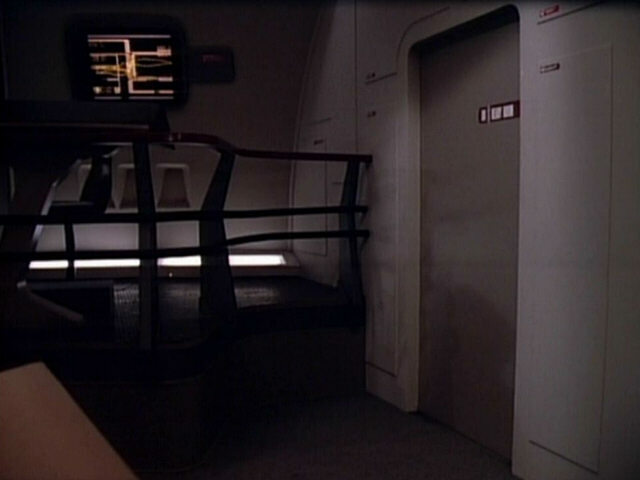 A tripod is briefly visible, tucked away in the alcove in front of the turbolift door. 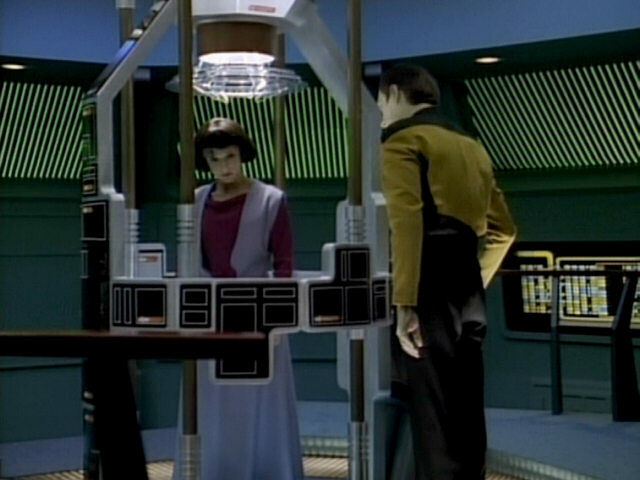 The tripod is still visible in TNG-R. 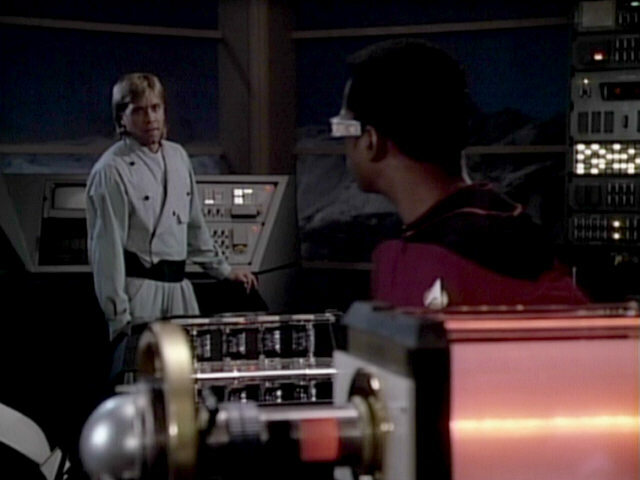 This is one of only two appearance of an Andorian in 24th century Star Trek, the second being in "Captain's Holiday". 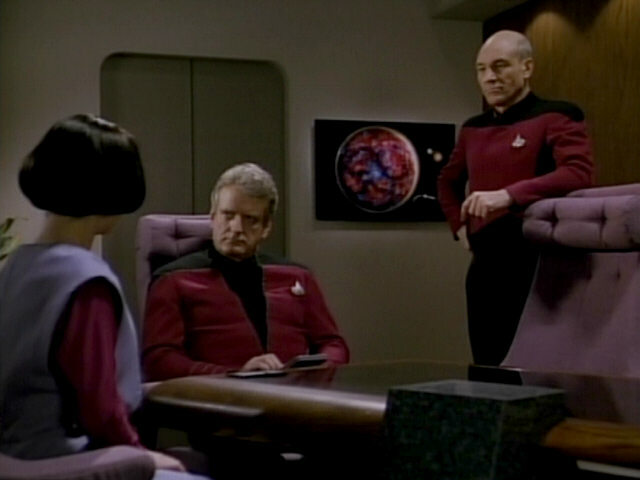 An Andorian was last seen in the Federation Council chambers in "Star Trek IV: The Voyage Home". 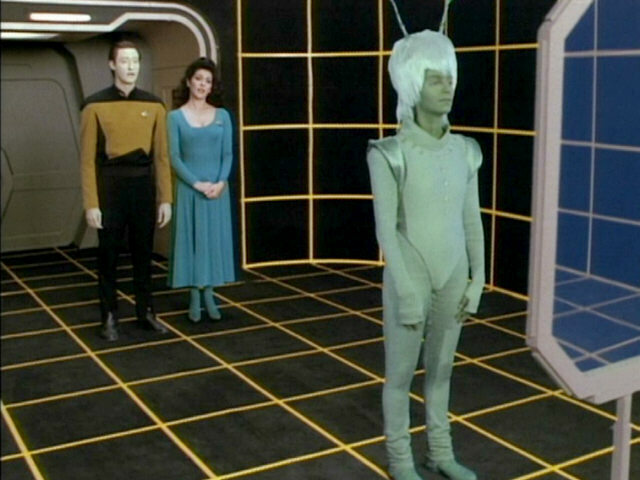 The appearance of the Andorian female is noticeably different from earlier and later appearances. 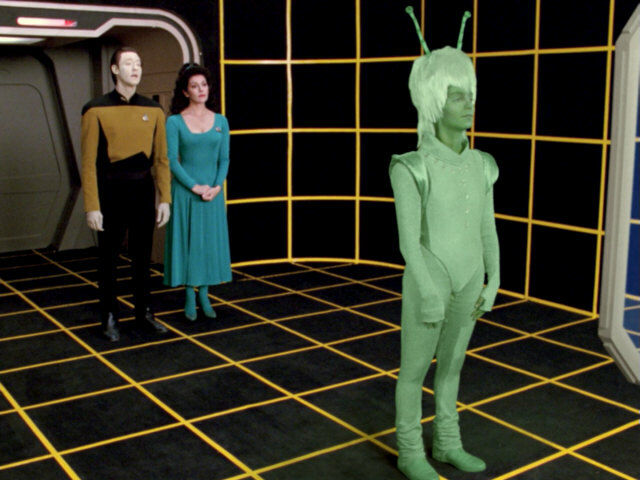 Her skin color appears to be more green than blue in this episode and her antennae are longer than regular Andorian antennae. 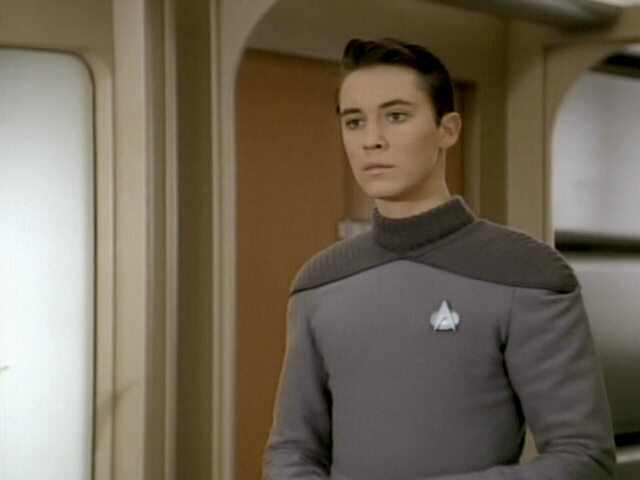 For all we know the make-up applied for the episode is brownish and appears in a false green color here. 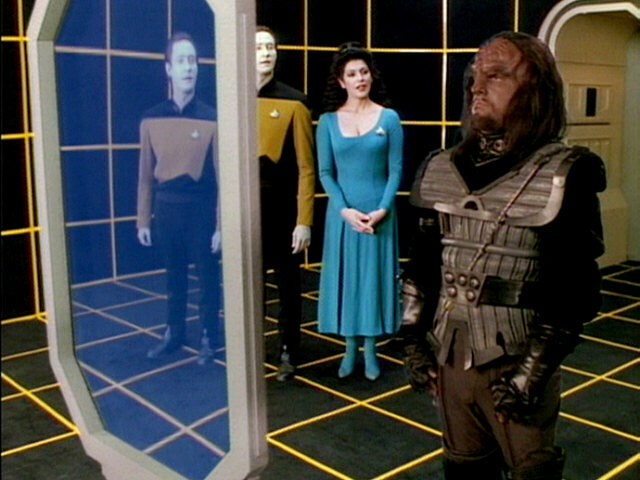 Lal's other choices, a human male, a human female and a Klingon male, appear in natural colors. 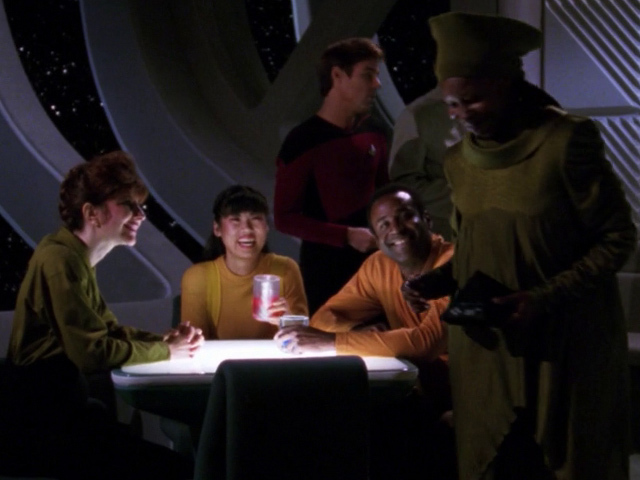 Races with Changing Faces - Major Races The color of the Andorian woman is pale green in the remastered episode as well, although the originally filmed skin color must have been brown and Andorians should be blue. 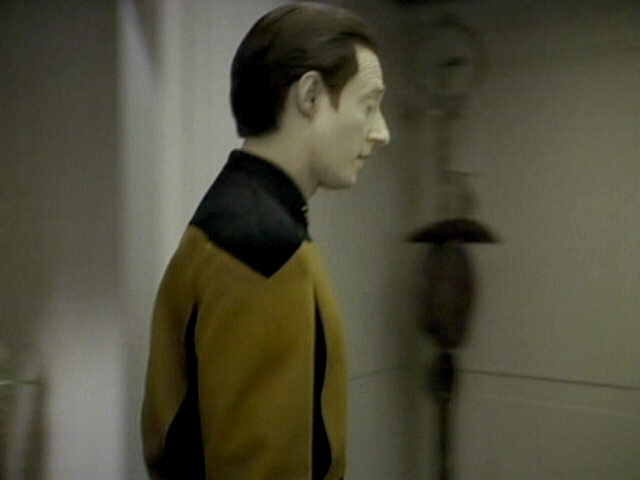 The sculpture seen briefly in Data's quarters also appeared in his quarters in "The Measure of a Man". 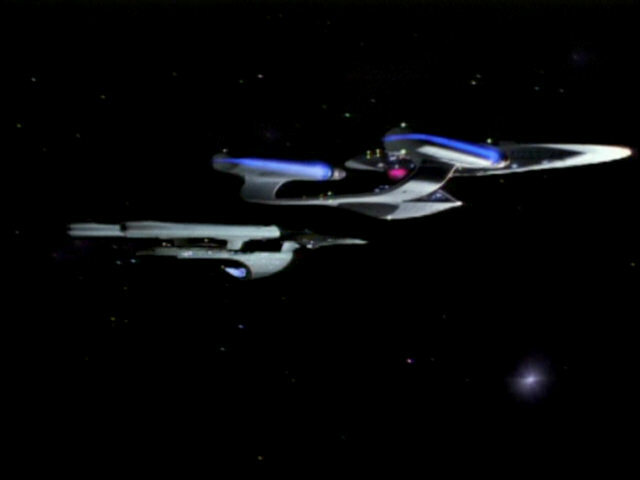 It was also seen on Aldea in "When the Bough Breaks", on Rubicun III in "Justice" and on Delta Rana IV in "The Survivors". 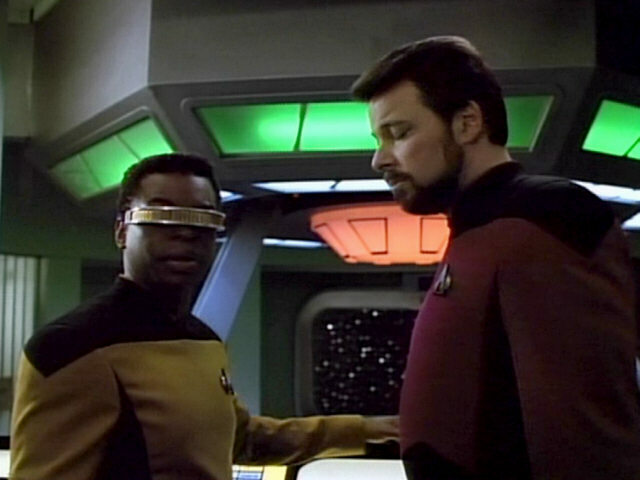 This is only the second appearance of the junior officers' quarters in season 3 after Worf's quarters were briefly seen in "The Bonding". 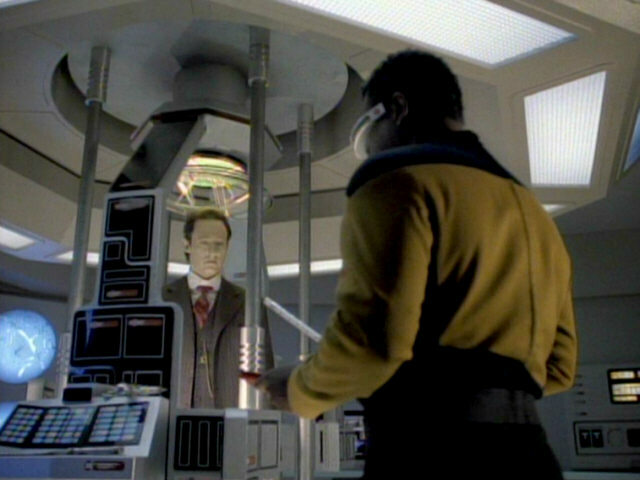 The part of the set seen in the screenshot has not changed since it was last seen as Data's quarters in "Peak Performance". 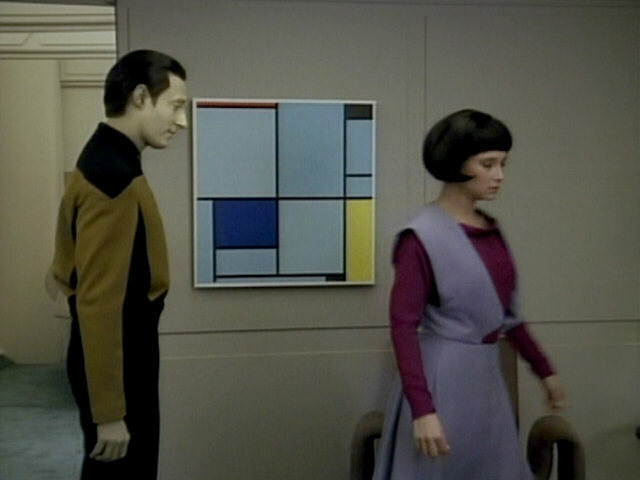 A copy of the colorful painting "Tableau I with Red, Black, Blue and Yellow" by Piet Mondriaan is first seen in Data's quarters in this episode. 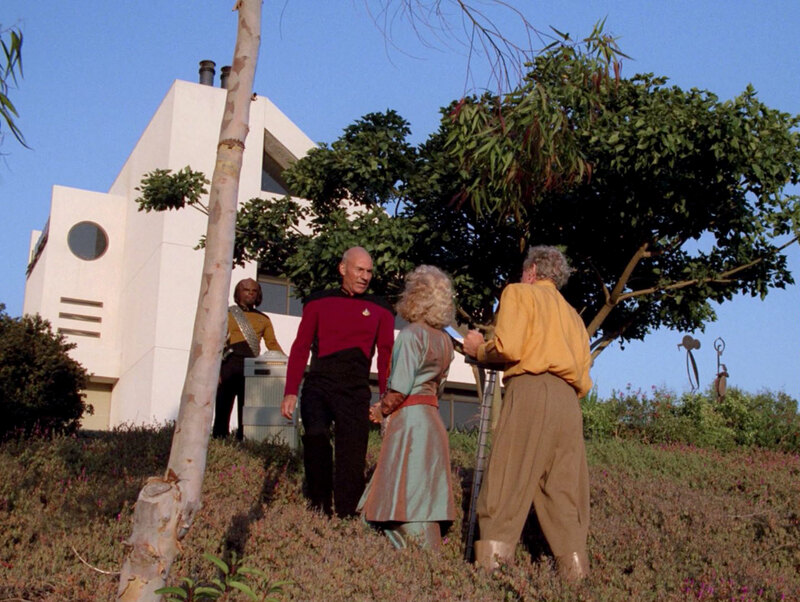 It is visible in nearly every later appearance of his quarters until "Star Trek Generations". 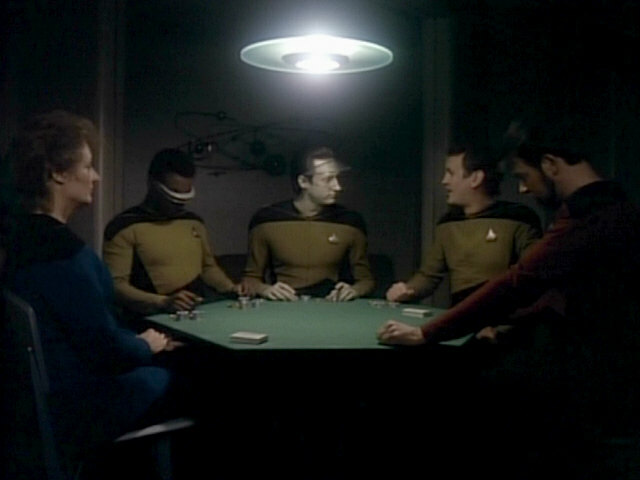 This part of Data's quarters was previously only seen during dark poker games. 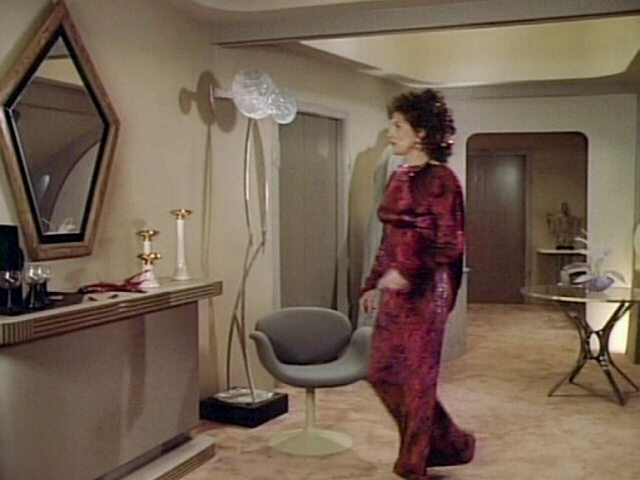 The metallic wall decoration was part of the set since the beginning of season 2. 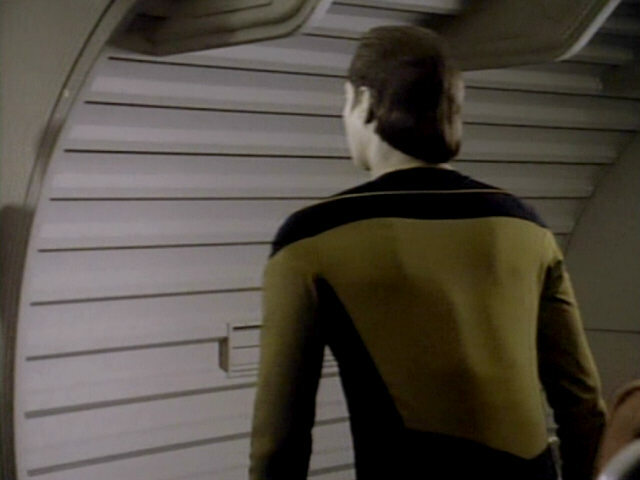 The wall ribbing was added between "The Measure of a Man" and "The Emissary" at around the same time as the office part of the quarters was similarly modified. 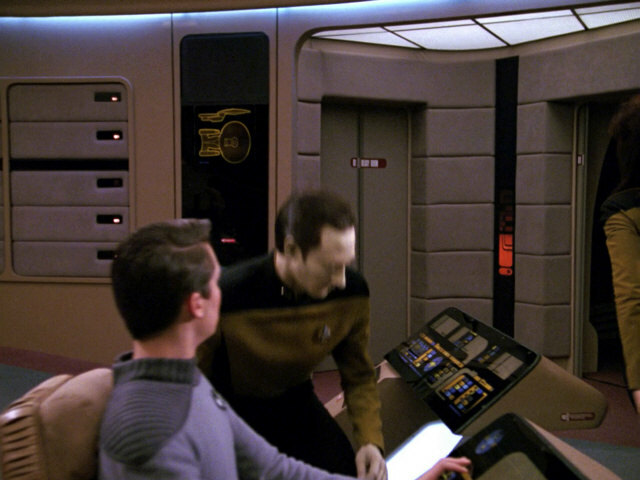 Data and Wesley test Lal's reflexes in a corridor lounge, which is a redress of main engineering. 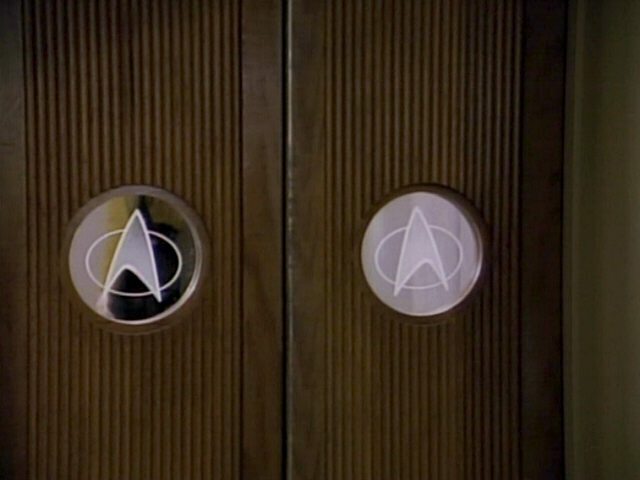 The doors to the left and right of the MSD are rarely seen when the set appears as main engineering. 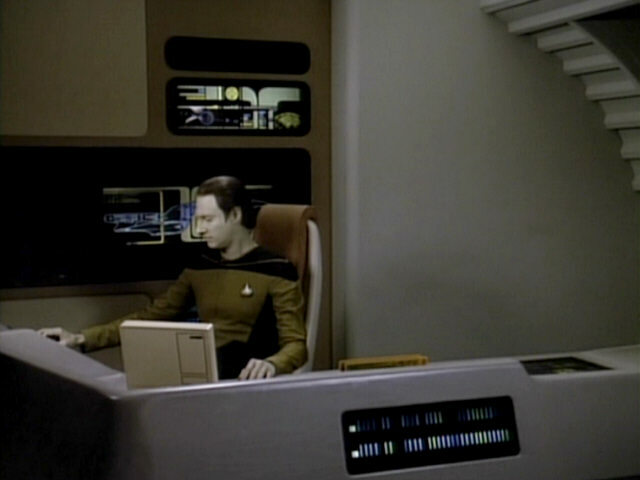 The graphics and text viewed by Lal on a desktop monitor in Data's quarters were all re-used from earlier episodes. The first screen originally appeared in "Contagion", it's a graphic of the USS Yamato. 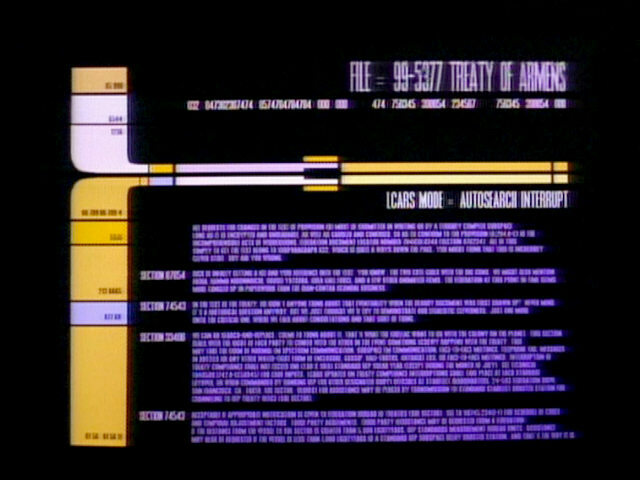 The text was originally seen in "The Ensigns of Command" and is a page from the Treaty of Armens. 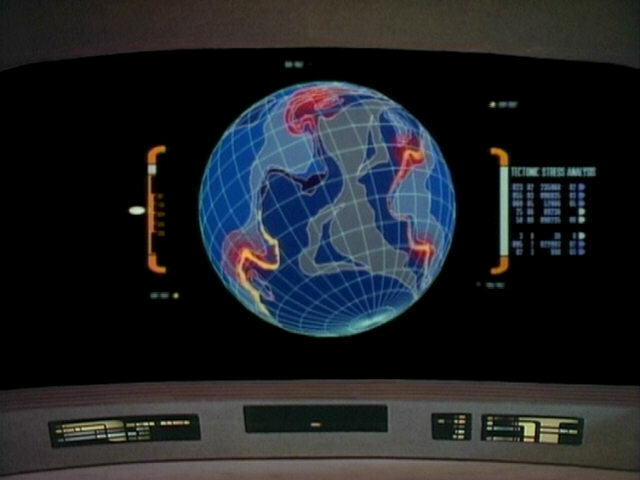 The graphic of the planet was originally seen on the main viewscreen in "Pen Pals" and depicts Drema IV. "Contagion" We can read the text in HD. 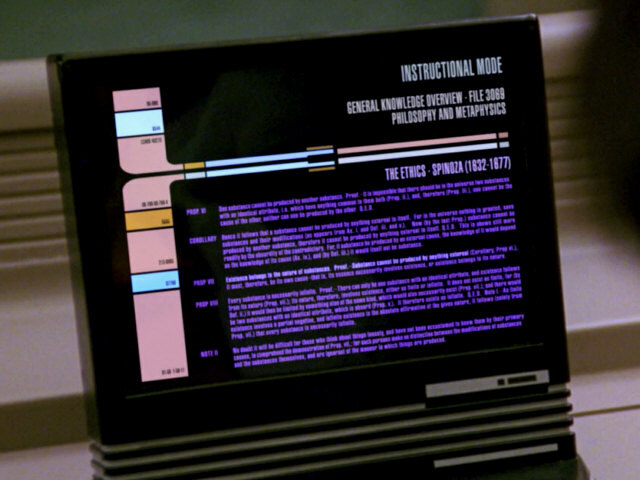 Note that the heading "The Ethics - Spinoza (1632-1677)" appears on the screen with the text from the Treaty of Armens. 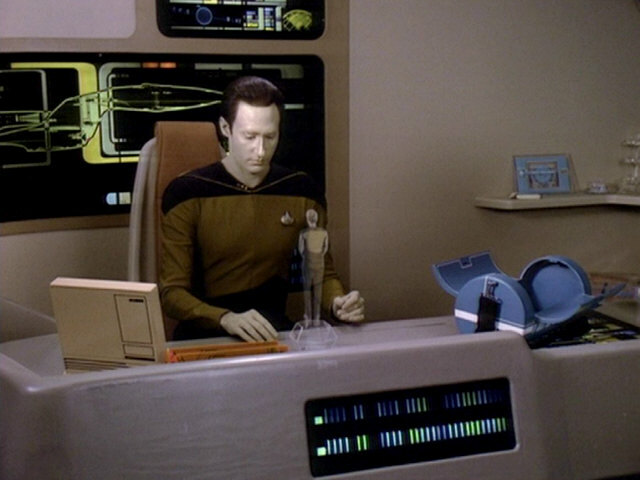 The graphic of the USS Enterprise-D behind the desk in Data's quarters was last seen in "Peak Performance". 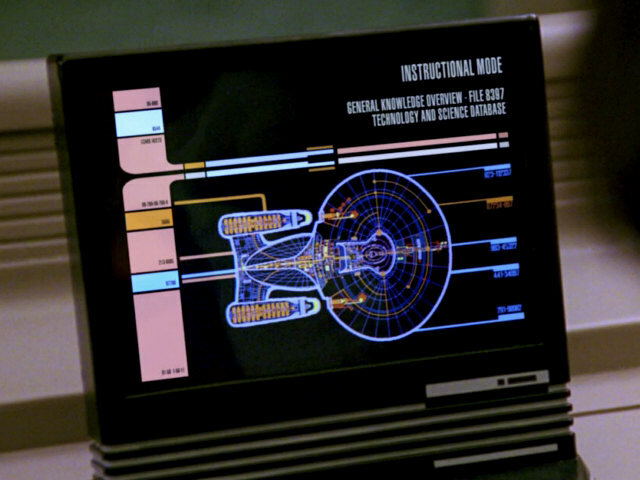 Originally, the display featured a large side view of the USS Enterprise-D, similar to the MSD in main engineering. 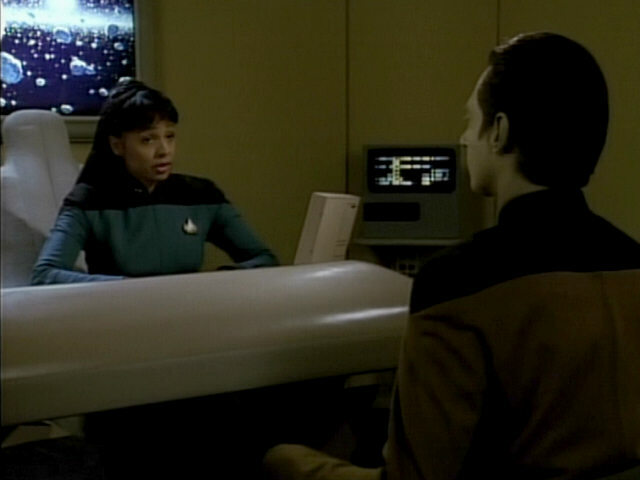 For "Pen Pals", the graphic was reduced in size to make space for a monitor used to display live video feed. 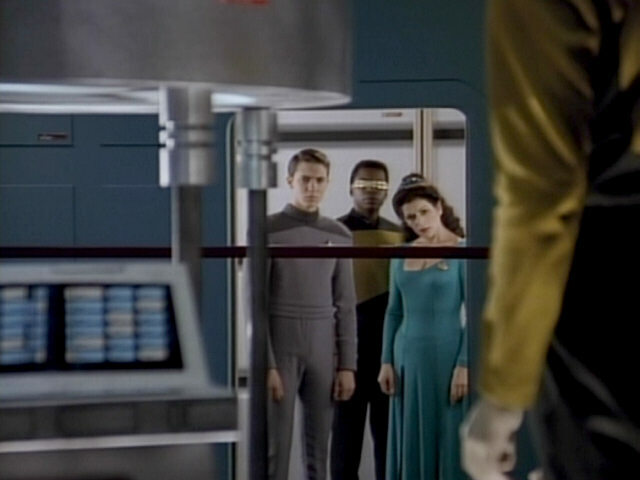 The smaller graphic is seen in the screenshot from "Peak Performance". 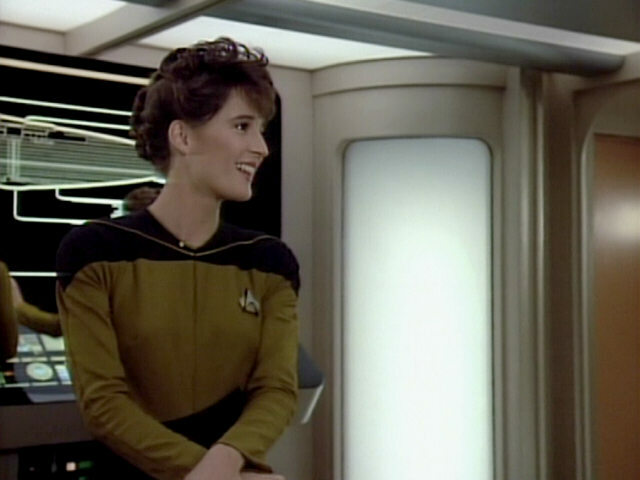 For "The Offspring", the graphic was enlarged again. 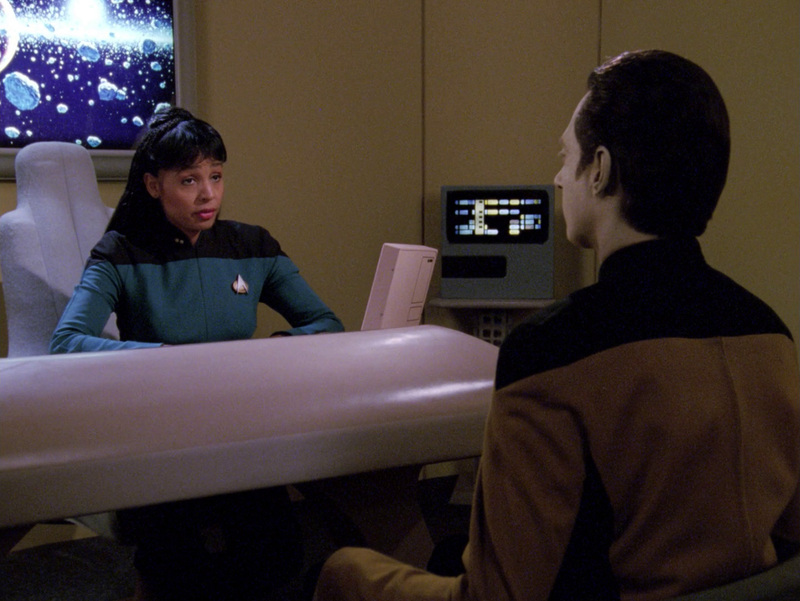 This larger graphic is different from the one seen in the first and second seasons (pre-"Pen Pals"), though. 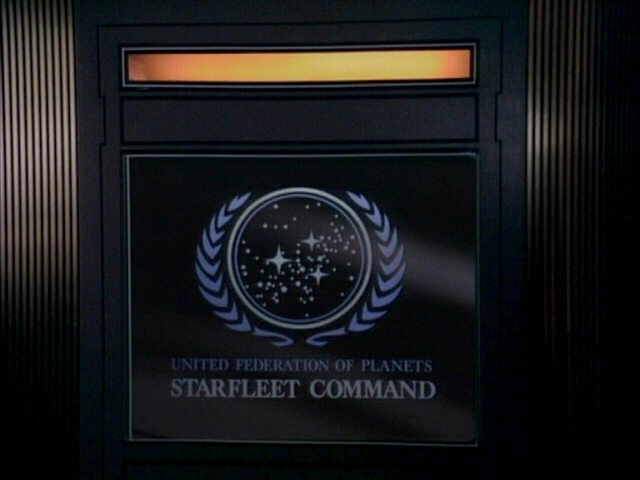 The main door to the cybernetics lab shows some similarities with the battle bridge ready room door, which was removed from the set at the beginning of the third season to make room for the large double door used to enter drawing room 5 in "Booby Trap". 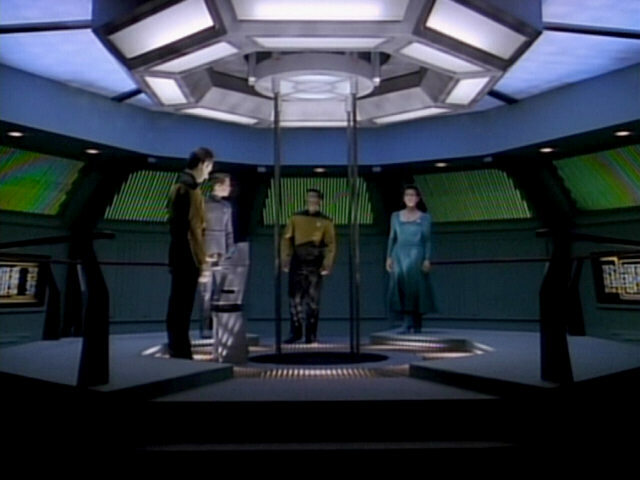 The wall with the smaller door is a little wider than the original ready room wall and extends a little further into the room. 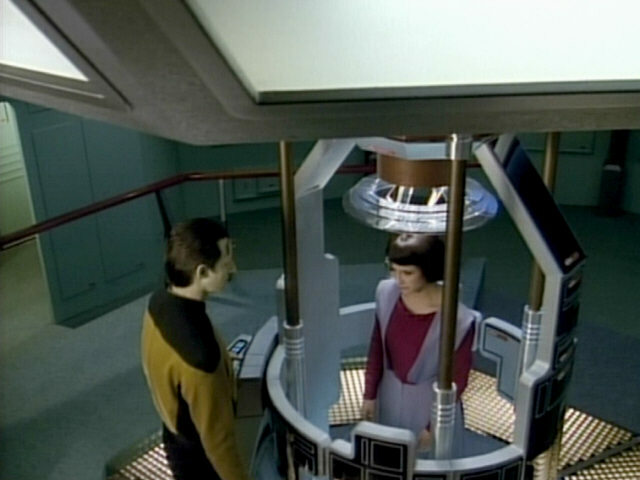 The cybernetics lab lift with circular railing also appears in the cybernetics lab in later episodes, like "The Best of Both Worlds II", "I, Borg", "Time's Arrow II" and "Interface". 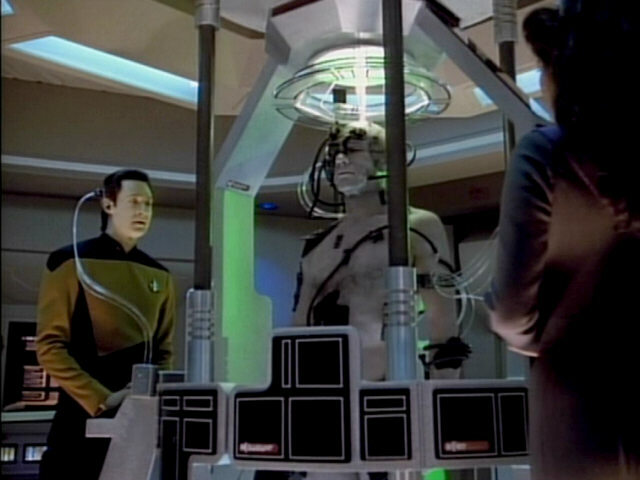 "I, Borg" A better look at the lab in HD. 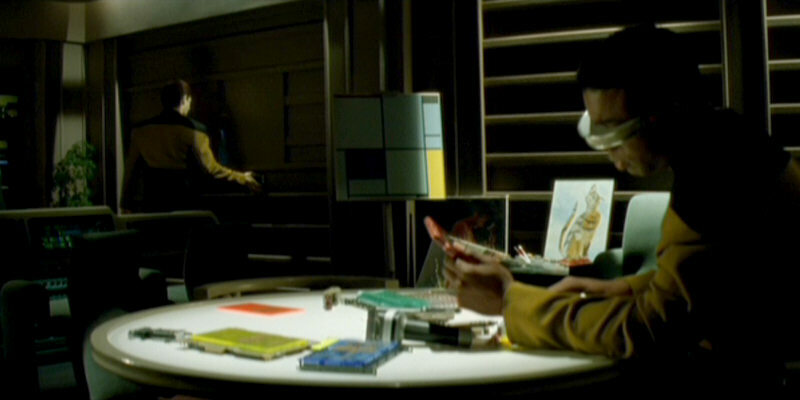 The yellow classroom (with attached teacher's office) is a redress of the children's play area seen in "The Child". 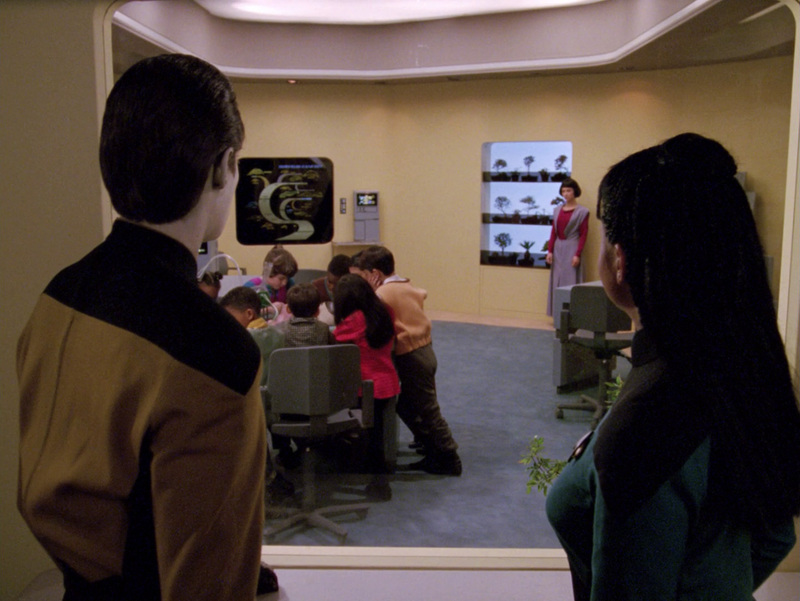 This is the second appearance of a classroom after a different set was seen in "When the Bough Breaks". 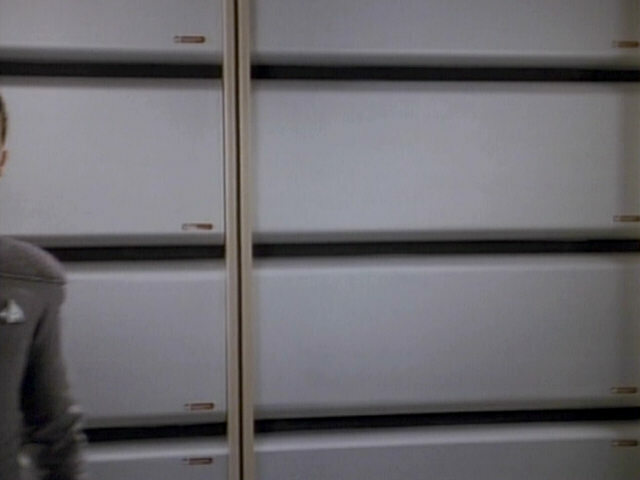 Only a small section of the teacher's office appeared briefly in "The Bonding". 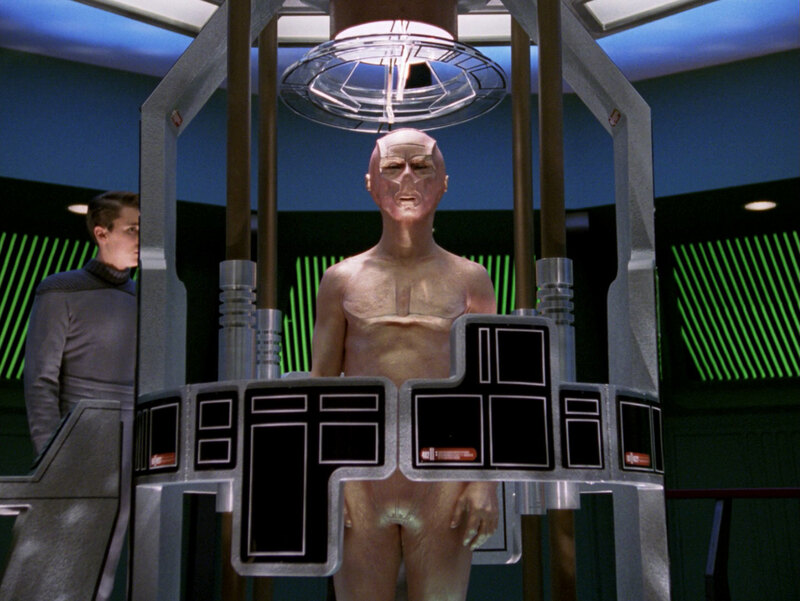 The set later appeared in "Reunion", "Hero Worship", "Imaginary Friend", "Rascals" and "Masks". 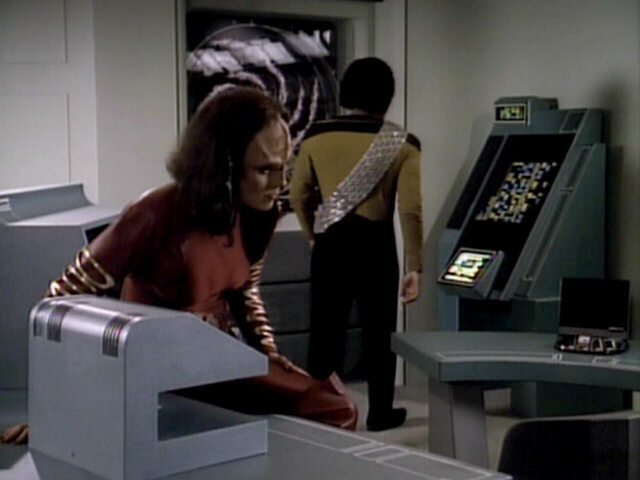 The consoles seen in the connected sets appeared in some previous episodes like "The Emissary" and "Evolution". 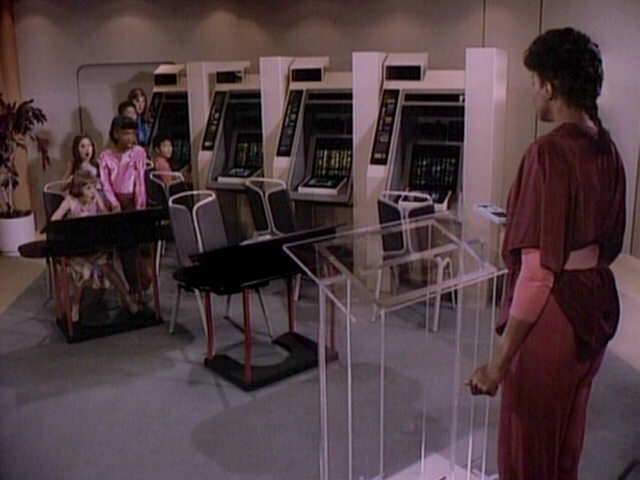 The large school computer was originally created for the classroom seen in "When the Bough Breaks". 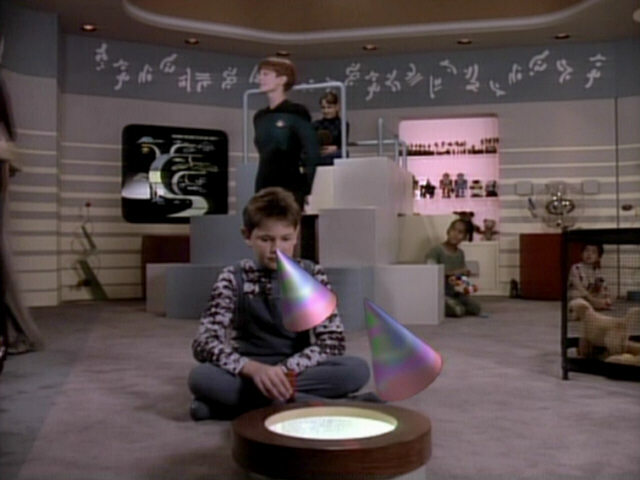 The large LCARS display with an evolutionary table of alien aquatic lifeforms was already part of the set in "The Child", as was the lit "window" with toys/plants on shelves. 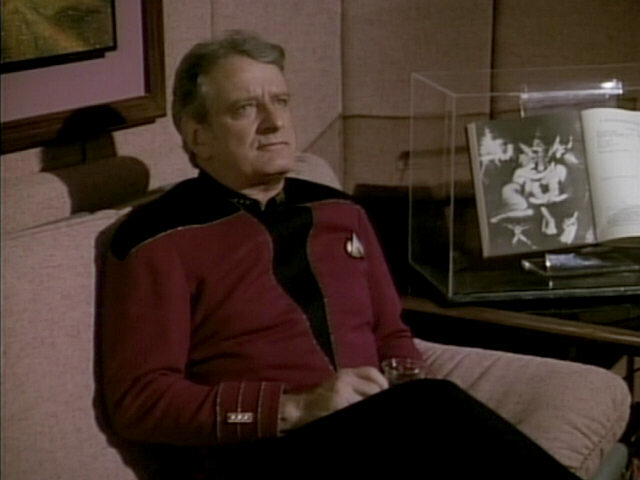 "The Child" We can see the painting and the evolutionary table better in HD. 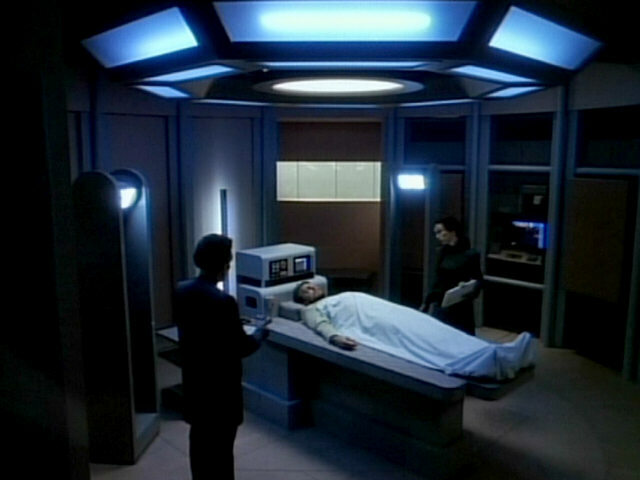 The four oil-filled cylinders in the sickbay office originally appeared in the terraforming lab on Velara III in "Home Soil". 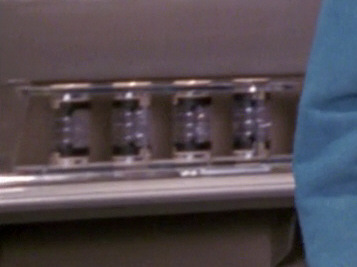 "Home Soil" A closer look at the cylinders. 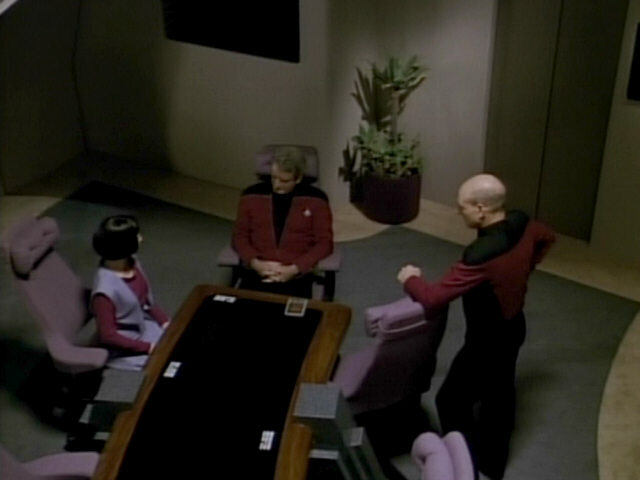 The monitor in Picard's ready room was previously seen in "Conspiracy". 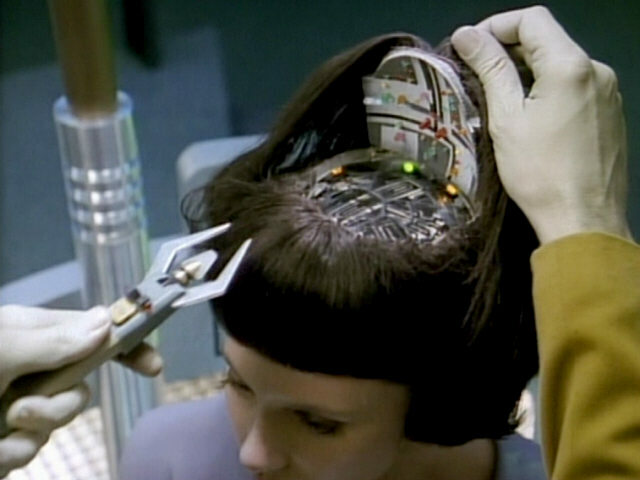 It was turned upside down for the re-use in this episode. 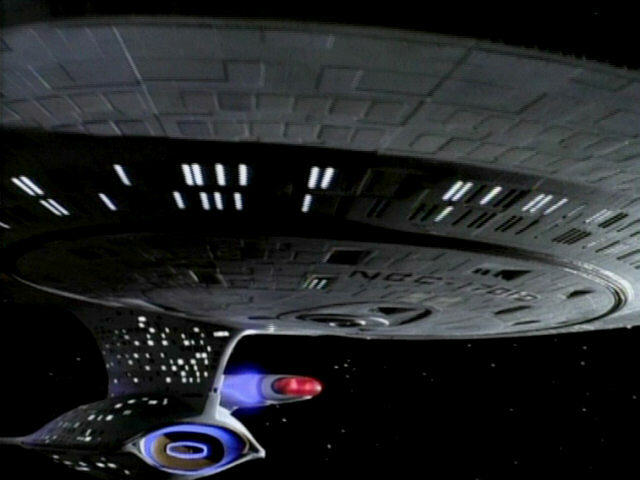 The smooth hull of the 6-foot model of the USS Enterprise-D is never more evident than in this shot. 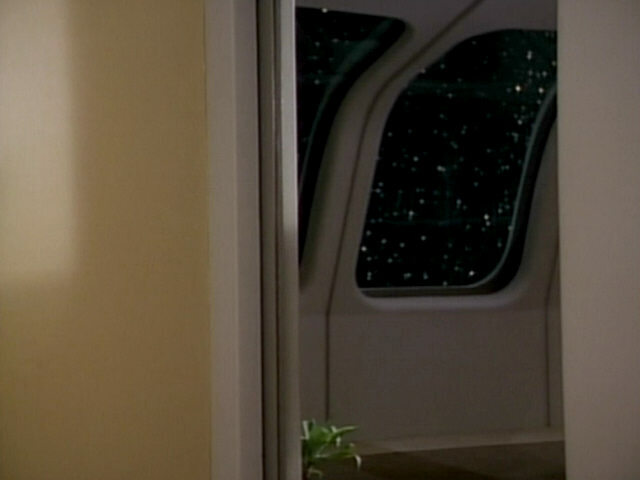 The 4-foot model, first seen in "The Defector", has much more noticeable hull plating. 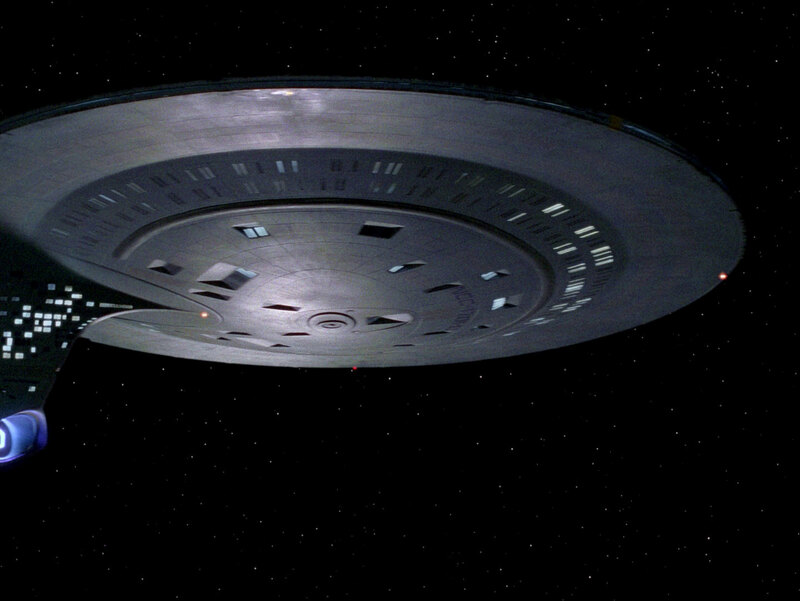 Enterprise" The 6-foot saucer hull in HD. 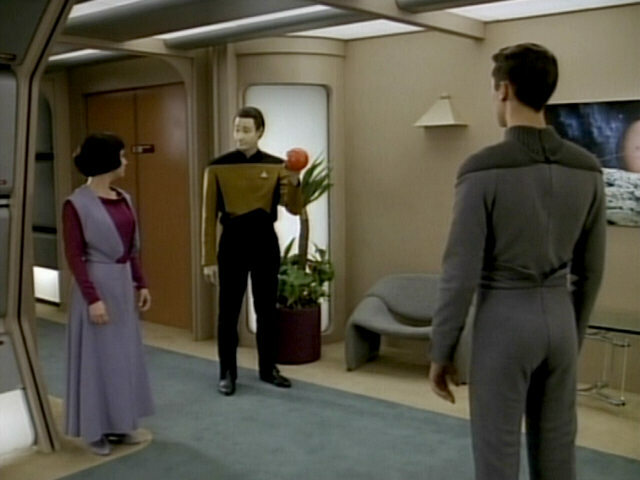 This shot is remarkable in two ways. 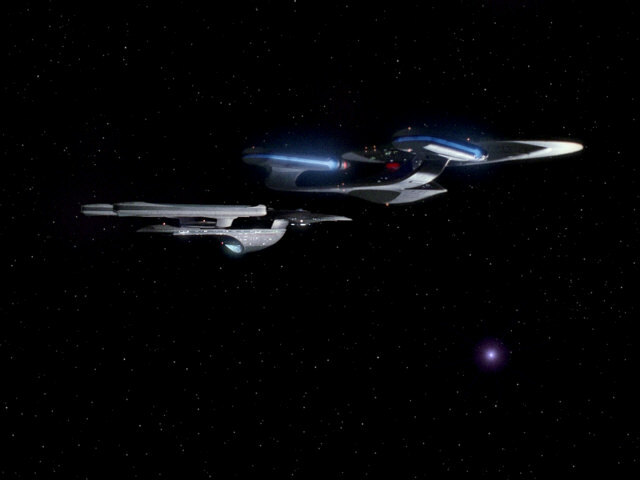 First, a Vulcan is briefly seen in the background of Ten Forward. 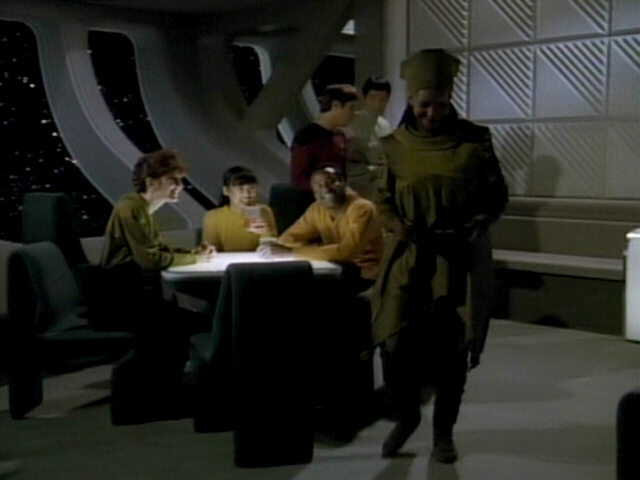 Second, Guinan is seen removing the Pair Match game from a Ten Forward table and taking it behind the bar. 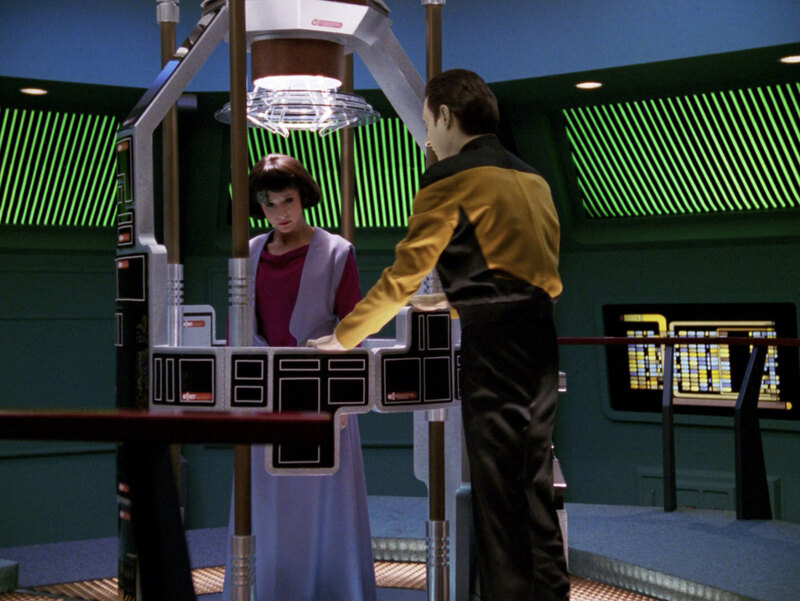 This is one of the rare cases when the prop is actually in use and not just standing on a Ten Forward table. 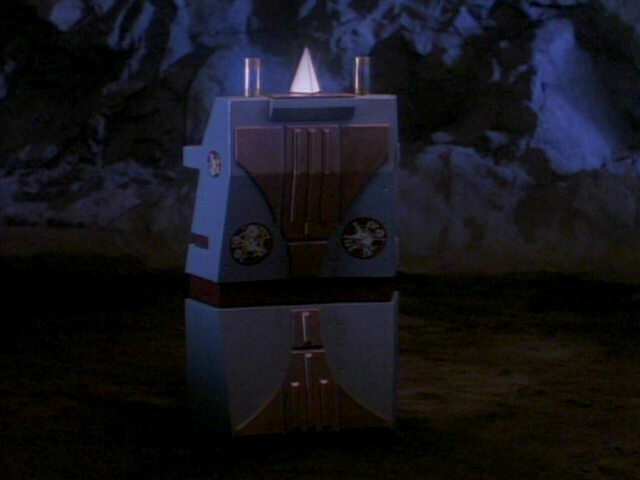 A close-up of the Vulcan and the game pyramid. 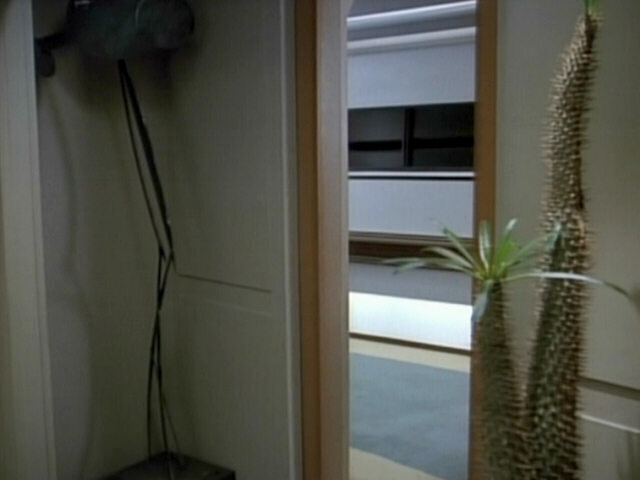 Another large sculpture is seen in Data's quarters. 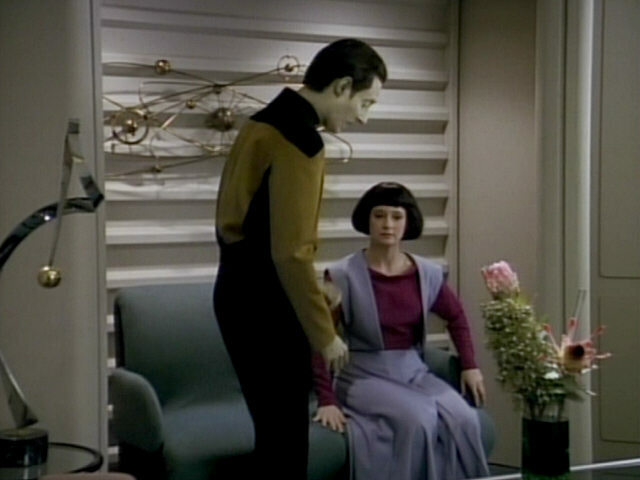 This sculpture also appeared in Lwaxana Troi's quarters in "Haven" and on Delta Rana IV in "The Survivors". 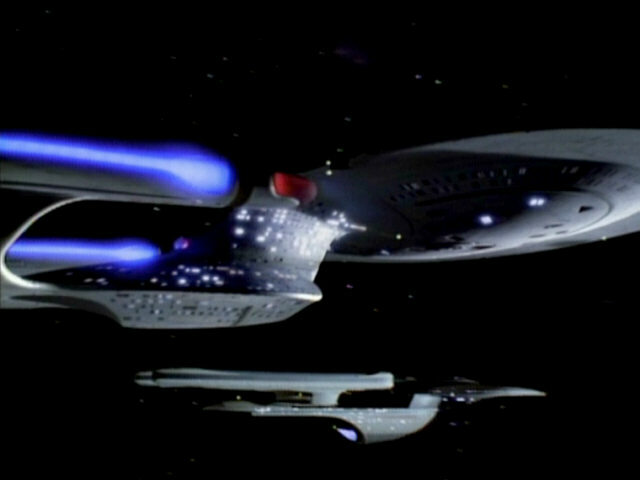 The scene of the USS Enterprise-D flying next to an unnamed Excelsior class vessel was originally created for "The Child" where the Excelsior class vessel was the USS Repulse. 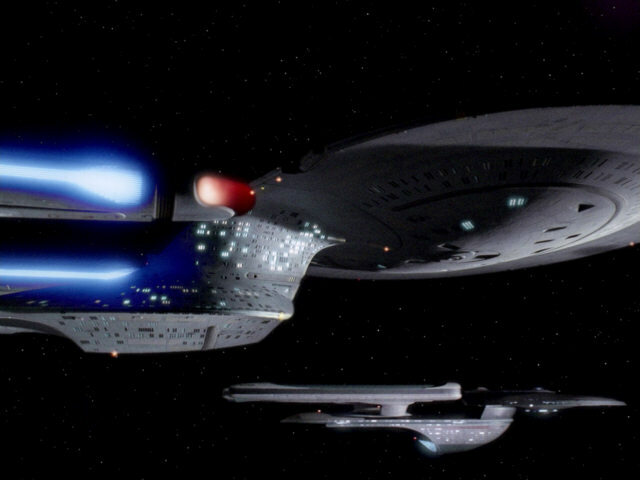 "The Child" The two starships as they appear in TNG-R. 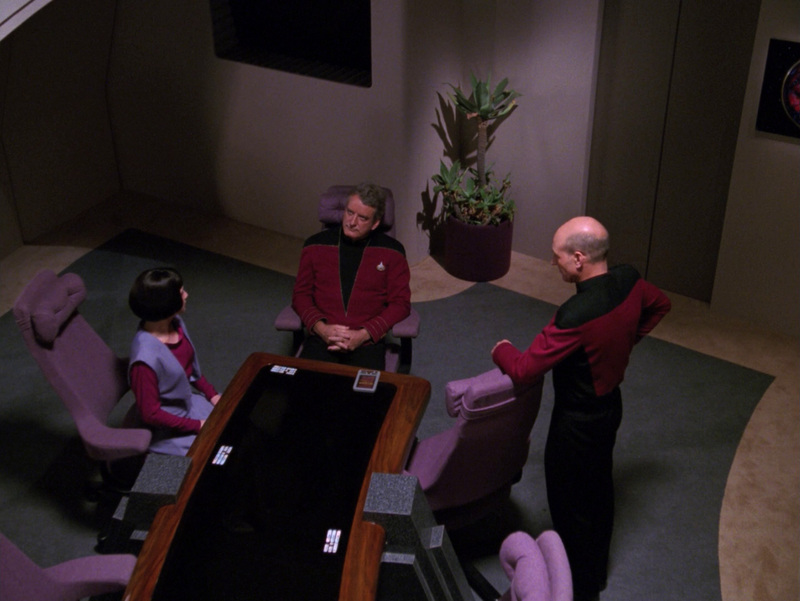 The Shakespeare tome in Picard's ready room can never be seen as well as in this shot. 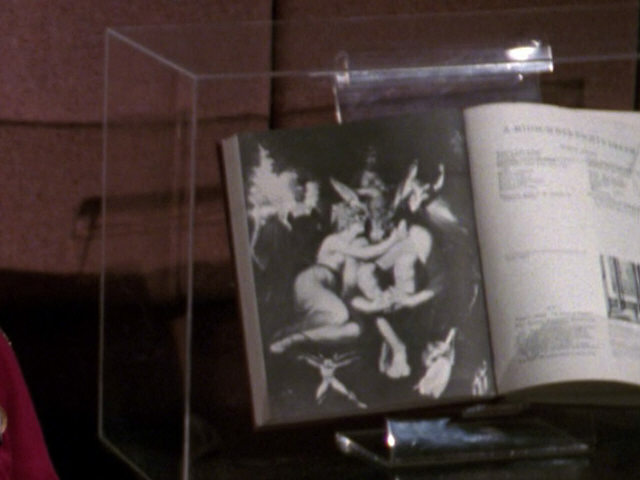 The book is The Annotated Shakespeare, Volume I. The page shows Titania and Nick Bottom, transformed into a donkey, and is an illustration for A Midsummer Night's Dream created by Henry Fuselli. 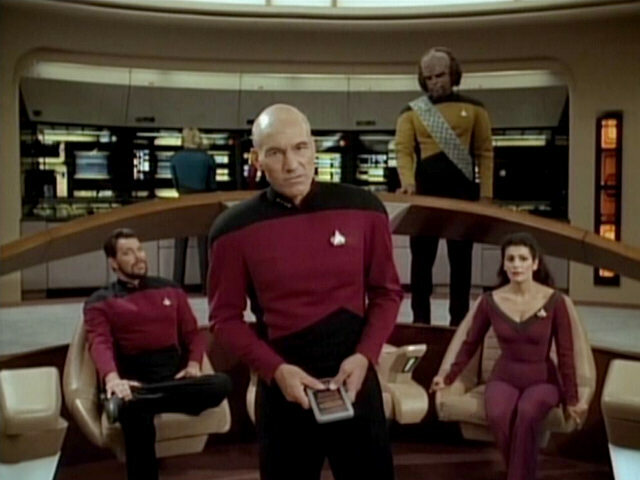 Picard's Shakespeare Books We can recognize the page even better in HD. 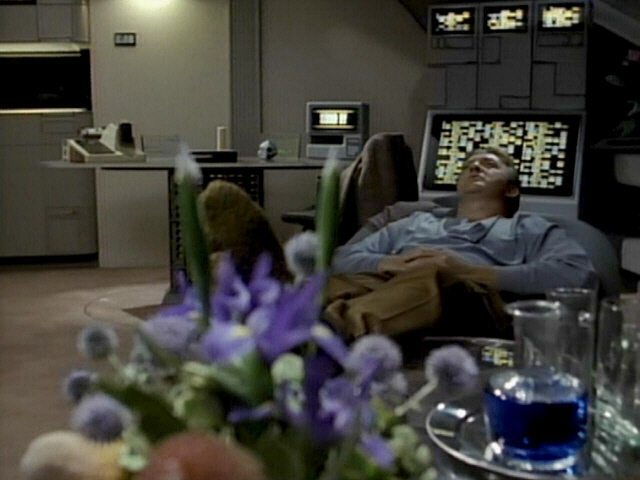 In one scene, a PADD is seen lying on the observation lounge table in front of Admiral Haftel. 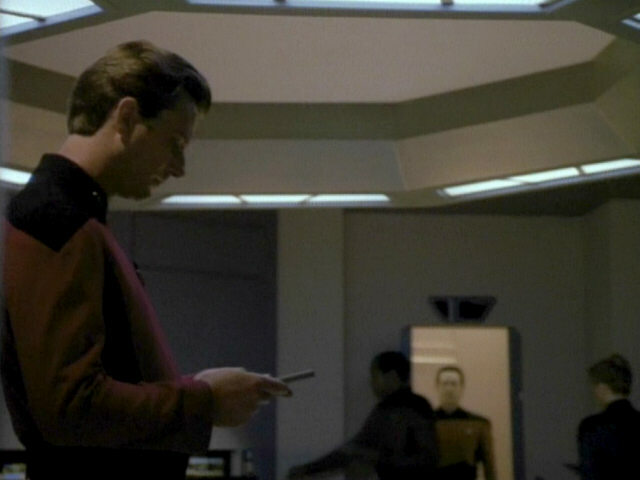 Just a frame later, he is seen holding the PADD in his hand. 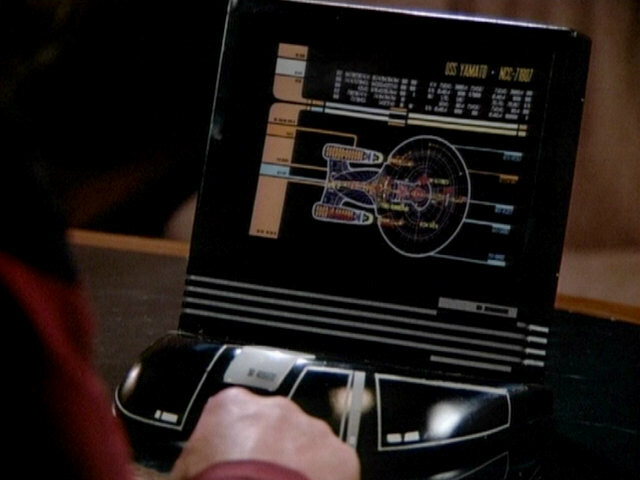 The PADD was originally created for "The Ensigns of Command", where Picard uses it to quote from the Treaty of Armens to the Sheliak. of Command" An HD close-up of the PADD. 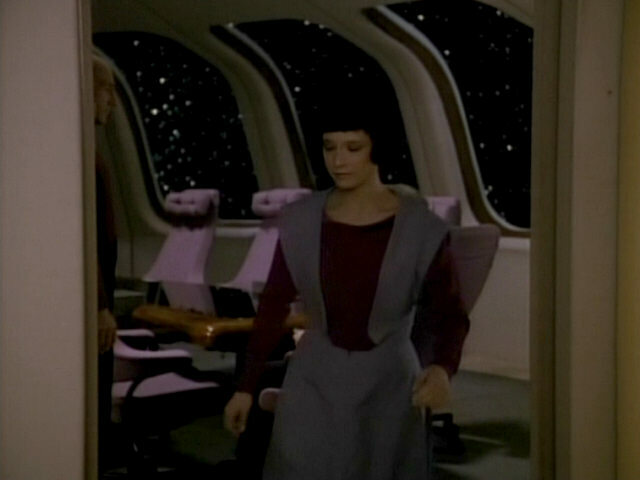 The observation lounge was first seen from the inside of the short starboard corridor leading to the room in "The Price". 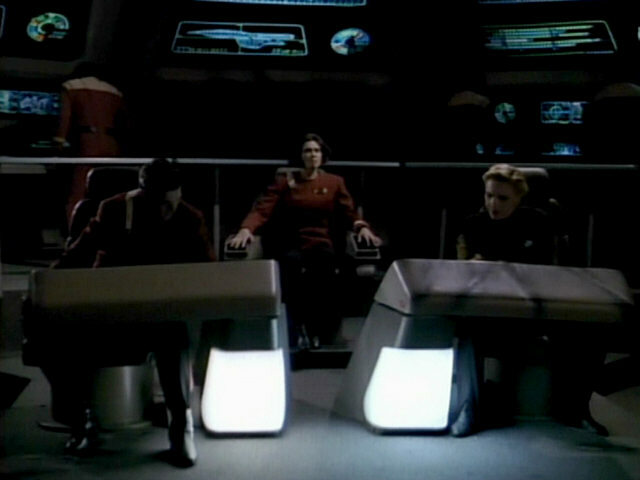 Here, the set is seen from the interior of the port corridor for the first time. 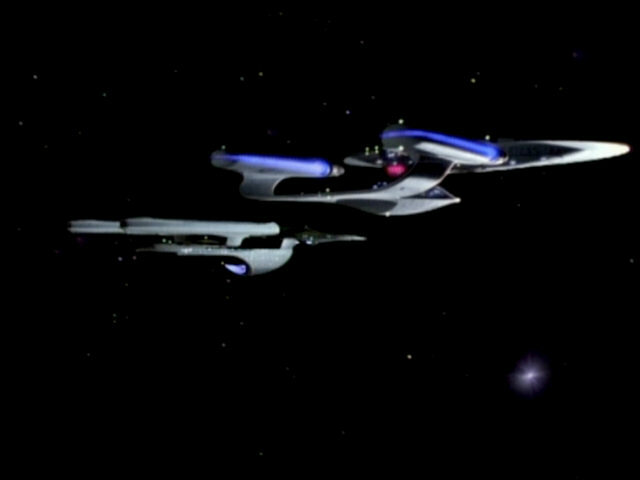 The shot of the USS Enterprise-D next to the Excelsior class ship (a re-use from "The Child") is continued in this scene. 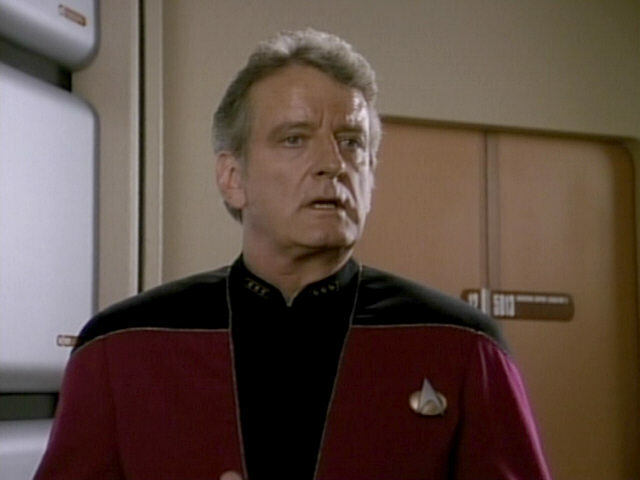 The unnamed star seen here was identified as Alvacorn Major in "The Child". 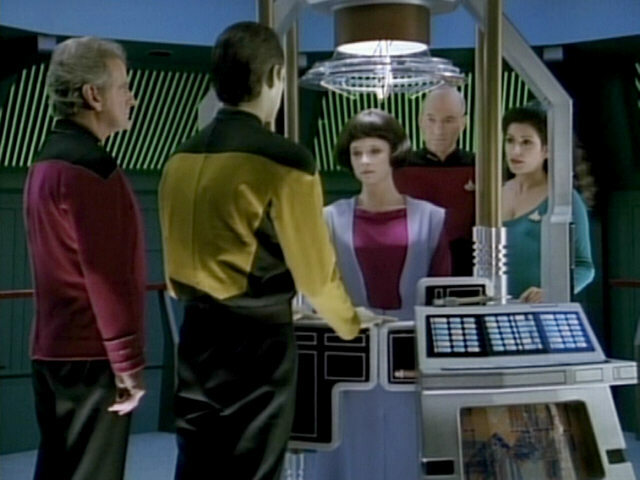 The console in front of the central cybernetics lab lift was created for this episode. 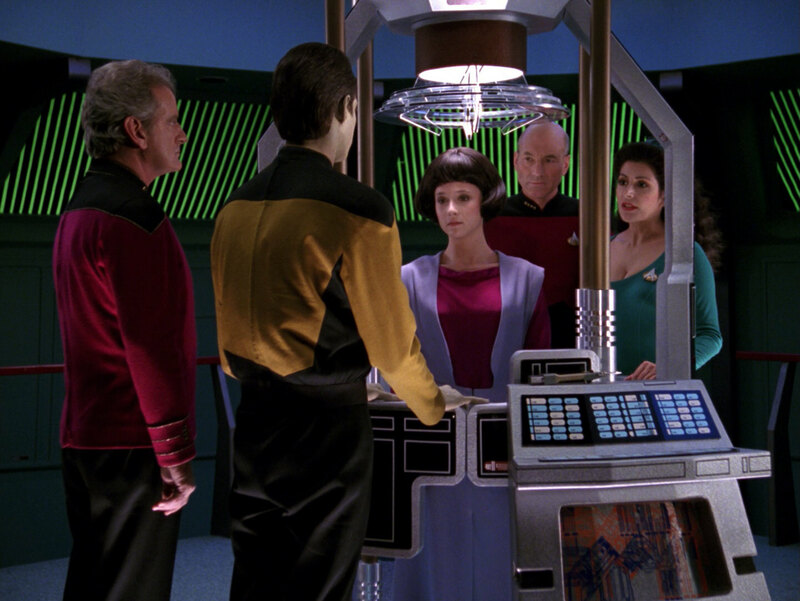 It appeared whenever the set was re-used in later episodes and was also seen as a Cardassian console in "Chain of Command I" and a Borg console in "Descent II". "Descent II" A better look at the console in HD. 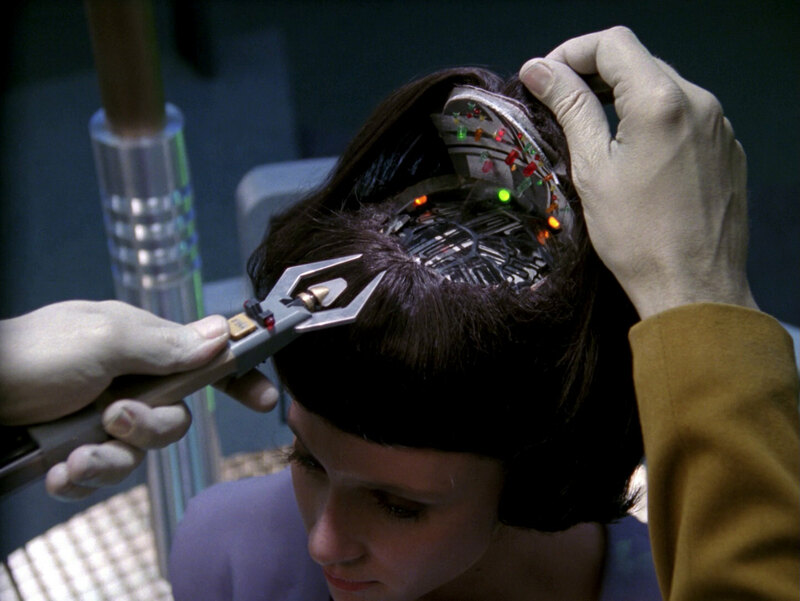 The circuitry in Lal's head is exposed in this shot. 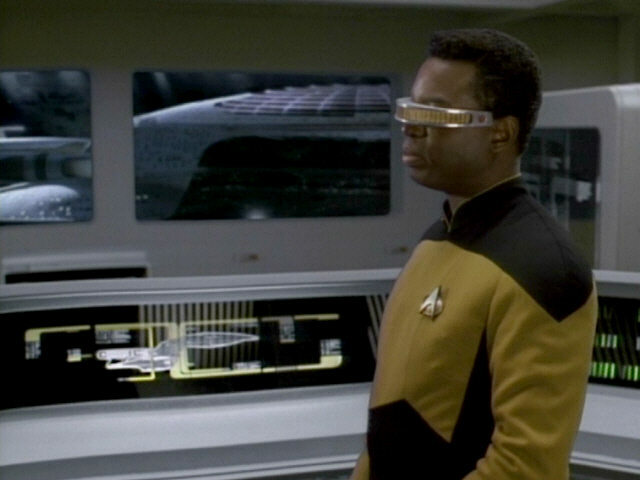 We can see the details better in HD, including the 20th century LEDs. 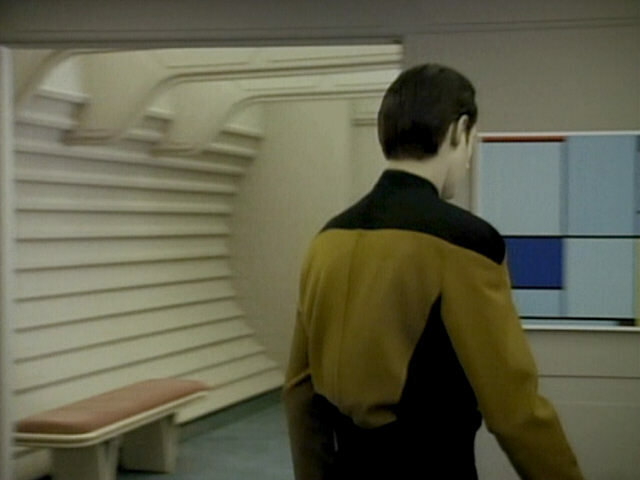 The outside of the cybernetics lab is seen in this shot when Admiral Haftel is leaving the lab. 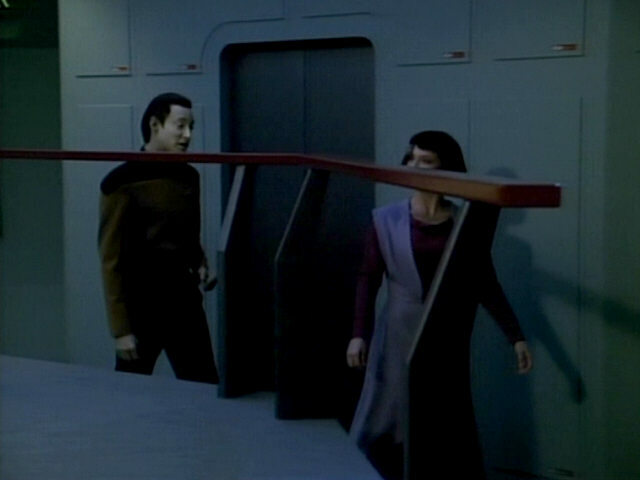 The corridor wall was especially created for this scene. 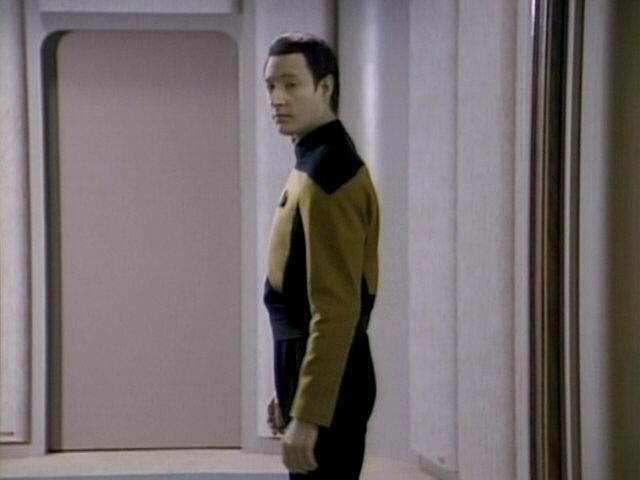 Though similar in appearance, it doesn't match any wall or door of the recently extended large corridor set. 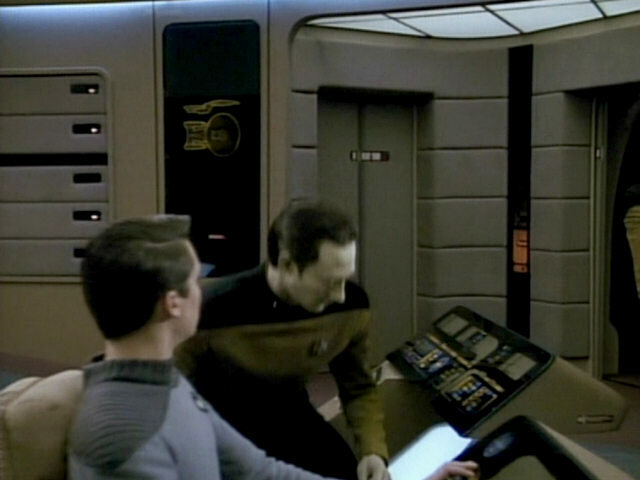 When Data relieves the unnamed conn officer towards the end of the episode, the turbolift opposite the ready room door can briefly be seen. 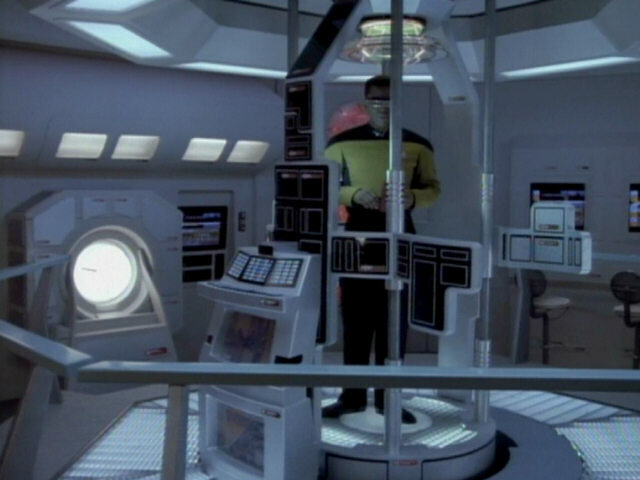 It is standing open and the turbolift is not lit. 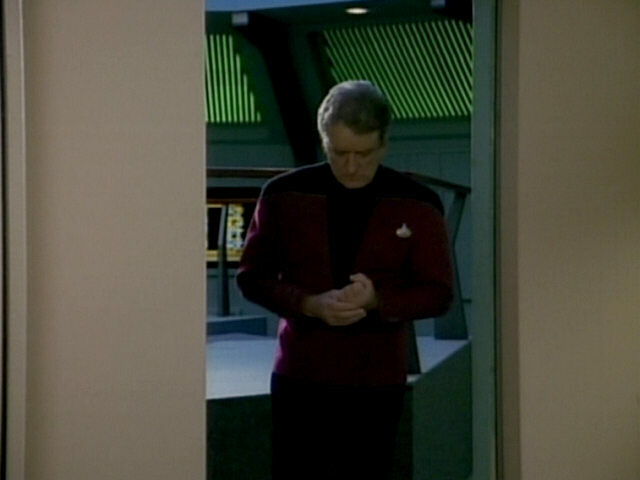 Apparently the door was not meant to be seen in the shot. 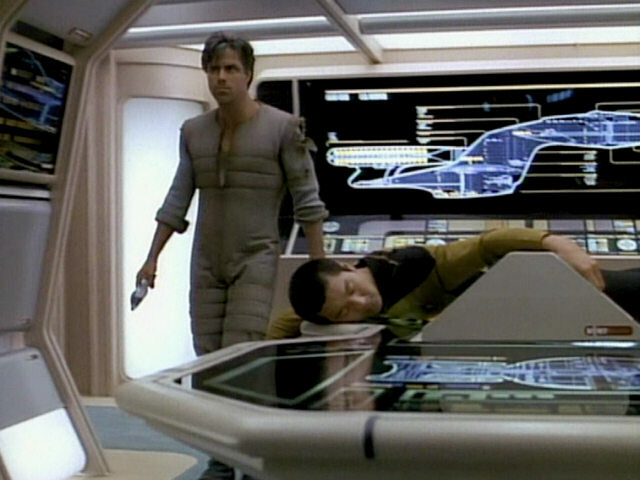 This is still the same in TNG-R.